/ Congo (Dem. Rep. of Congo) / 11/04/2017: Ready for What? Recently, I heard a sermon about getting ready and being ready. Perhaps you have heard sermons on that topic too. When I heard it, I wanted to ask the speaker, “Ready for what?” Yes, we should get ready and be always ready for the glorious appearing of our Savior, but I think the Scriptures give us even more duties to be ready for. You’ll see what I mean when I tell you a story. Brother Joel Mapamu of Democratic Republic of the Congo had begun to get ready for another mission trip to the Sankuru Region of his country, something he does once a year. As he prepared and I helped raise funds, we both prayed fervently, waiting to see how God would answer. Then suddenly something happened. The enemy struck one of Joel’s family, attempting to discourage him from obeying the Lord’s command to go and work in His vineyard. Though tragic, this attack was nothing new: in past years, the devil has stricken one of Joel’s family members before a trip or after his return home. The oldest son of the family, Emmanuel Soni Mapamu, left Kinshasa by bus bound for Namibia University. At Nkulu, a village near the border of Angola, the bus collided with a truck and flipped upside down into a valley with terraces, where it rolled twice before stopping. Four passengers died immediately and others were badly injured. By God’s grace Emmanuel survived, although very severely wounded. An Adventist lady traveling on the same bus called Brother Joel to tell him about the accident, and father and mother left the other six children and went to the scene of the accident. Missionary’s son recovering after tragic bus accident. The parents found their son in a Christian hospital unable to move. Tears flowed, especially with the mother. After a few days of her wailing over her son, the doctors asked the mother to return home. Brother Joel stayed for three long weeks. At last, a gift from a Swedish couple allowed them to pay the hospital bill and leave. 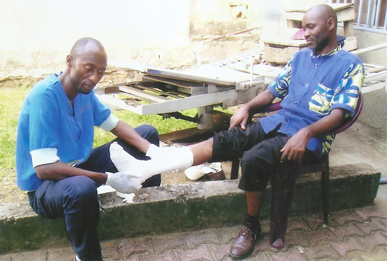 Joel took his injured son to a hospital in Kinshasa, near where the family lives. Back in his home city, Emmanuel continued improving. Brother Joel decided to go to Sankuru as planned in order to help, to teach, to preach and to baptize souls for the Kingdom of God. 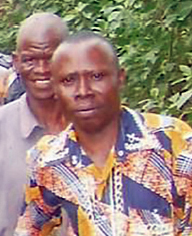 He has continued praying for his son’s healing and for help, especially for his travel expenses and for Bibles and study guides to take to the remote villages. He also needs malaria medication to take to the bush clinics. Brother Joel is ready. Are you ready? Ready to work in God’s vineyard even amidst difficulties? Ready to give where means are limited? Ready to work, ready to pray, ready to help, ready for sacrifice? My 92-year-old, widowed sister-in-law is ready. After losing her husband, she found peace in reading the Bible. Even in her care facility, this aged woman who doesn’t even speak the local language has been a witness to the ladies who care for her. How? She just keeps praying and studying her Bible. One young caregiver was very happy that the old lady prayed for her and her family! No matter where you are in life, you can be ready—ready to share, ready to pass on the blessings God gives you. Let’s all get ready and be ready to serve wherever God calls! Pray. Pray for the work in the remote regions of the Congo, and for the workers who must risk danger to take the light of the gospel to souls in these areas.